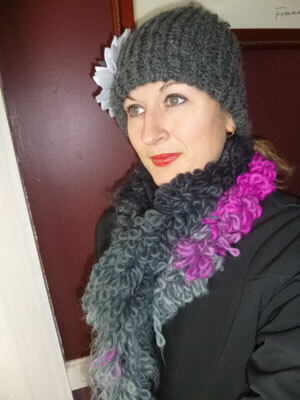 I stumbled upon how to make this scarf when I discovered the Swerve Yarn by Red Heart Boutique. 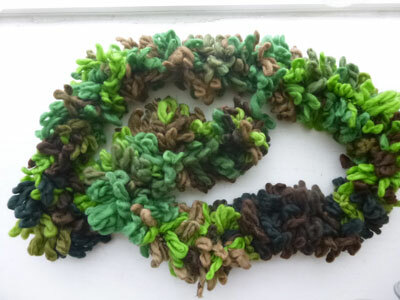 Even if you don’t knit, crochet, or loom knit YOU CAN make this scarf. I have made two of them already and my 7 1/2 year old daughter has made 3 of them. She made one for herself, which I cut off a few feet since she didn’t need as long of one as an adult did and she used the leftover to make a single chain scarf for her American Girl Doll. The color of the yarn she used is called “Vineyard” and is the one she is wearing in the above picture. She also made one to give her teacher as a present for Christmas and has asked me to buy her some more of this yarn so that she can make a couple for friends. 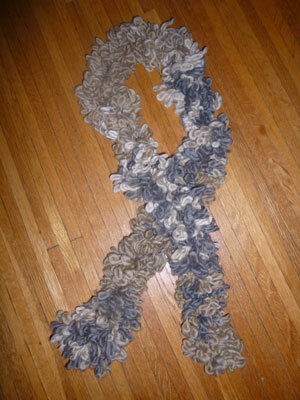 The Quick and Easy 3 Minute Swerve Yarn Scarf video shows me making it from start to finish. It is that quick and easy. The name of this color of yarn is called “Sahara.” The video also includes my son who just couldn’t stay out of the room while I made this, so please bear with his cameo appearance. The picture on the right is of me wearing the scarf I made for myself. The color of this yarn is called “Galaxy”. If you are interested in making the hat I am wearing in this picture, you can make it easily by following this Introduction to Loom Knitting Tutorial. You can see more pictures of the hat and the flower on the hat in my post called Flower Adorned Winter Loom Hat. Another idea to make a quick and easy scarf is to make a fleece scarf which all you need to do is cut fleece and maybe knot the fringe if desired. Why not make this year a homemade Christmas and keep friends and family warm with these easy to make scarf ideas. This is the scarf my daughter made for her primary teacher. You will certainly impress friends and family with this scarf as a homemade gift from you! Wow! I’m impressed. I like to crochet but just don’t have the time. It’s great how quick this method is! And the scarf looks more labor intensive than it is! Would make an impressive gift. I love the way the colors come together, it makes for a pretty unique scarf. It is wonderful your daughter is already so crafty. I can’t believe how fast this method is! As you can see from the video, it only takes 3 minutes from start to finish. Beautiful! I always wanted to learn how to crochet. This is even easier than crocheting. No tools are needed. You are basically just making a simple crochet chain with your hands. It’s so quick and easy to do! You are soooooo going to impress yourself by making this one then! This is awesome! How expensive is the yarn? Thank you for asking, Gina… because I realized the link was broken in the post! :-) Amazon has it for $2.41 a skein… but you have to pay $4.48 shipping. I’m thinking you could probably find other deals on it with coupons locally. I bought mine on a couple occasions from JoAnn Fabric’s on sale for $3.50 a skein, but I have seen it at Wal-Mart and I think the regular price on it was around $4.78. It was definitely under $5. Your daughter is so pretty and creative like her mom. ^_^ I like to make my own scarf like that too. Oh my gosh, this is so much fun! My 7yo daughter just made two and we’re heading out for more yarn. Thank you!!! I know! I just love that it looks more complicated and more expensive than it is. It really is a great gift! BTW, it was on sale for $3.99 at Joann Fabrics this week (which is a great gift price, in my opinion) but there were coupons too. I can’t thank you enough for the tutorial video. I would have been too intimidated to try it just seeing it on Pinterest. But you gave me the confidence to try. Our 7 year-old daughter and I are having a blast making these for family and friends this Christmas! Thanks, again! Yeah! I am so happy you are enjoying it! Thank you for letting me know. It makes me feel good that I have taught someone to do something crafty! Merry Christmas and thanks for helping us make Christmas gifts that extra special and homemade this year!